Rashpal Singh Rana, 49, stays in Faridabad with wife Bimal, 43, and son Vishal, 23. Rana was into advertising, but left his job and started his own advertising and marketing solutions business. Vishal was sent to the UK, where he studied for three years in Manchester University and then worked in Scotland for a year. Rashpal plans to send his son to the US next year for higher studies and is also planning for his son's marriage by 2023. Plus there will be a family trip to Canada this June and the Rana's have to prepare for that. Their monthly income amounts to Rs 3.20 lakh while household expenses add up to Rs 1.62 lakh and total insurance premiums cost them Rs 12,000 a month. It shows they have managed to control expenses and have a good savings ratio, but have no actual investments for future goals, which is a bad financial move. More important, about 82 per cent of the family's investment is in real estate, which is too high and, therefore, not desirable. They have insurance coverage, but it is not adequate. In fact, Rashpal needs to increase his life insurance cover and should get disability insurance as well. These are some key financial challenges every family is likely to face nowadays. So keep in mind your needs, priorities and the family mould-the Ranas here belong to the classic nuclear family-when you plan for a secure future. Assessing current investments will help plan effectively for the future. As mentioned above, the Rana family's exposure to real estate is 82 per cent of the total investment, even though real estate is illiquid in nature and the portfolio is not as diversified as it should be (See Table Where The Family Stands). 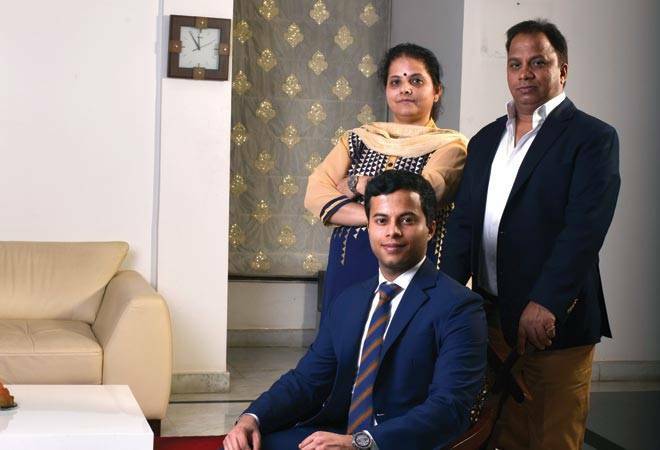 It is strongly recommend that the family should sell residential assets worth Rs 75 lakh post which they can invest Rs 50 lakh for their son's higher education and Rs 25 lakh for his marriage. However, returns from fixed deposits and postal schemes will be subject to taxation as per Rashpal's tax liabilities as an individual and it will reduce overall returns. This single disadvantage is enough to stay away from such schemes. Direct investment through stock markets requires in-depth research and analysis, and it may not be possible for the family to engage so intensely and devote so much time. Therefore, direct equity investment is not recommended and Rashpal is advised to invest only in diversified equity funds. He should also review his commercial real estate investments periodically (See Table Asset Allocations: Current and Recommended). When it comes to an emergency fund, make sure you have enough backup income to see you through in case things go wrong. Here is how the Rana family should do it. Build a contingency fund: The Rana's must have a contingency fund that will cover their expenses for six months. Their existing savings bank balance of Rs 4 lakh and LIC maturity value (due in 2017) of Rs 5 lakh should be allocated towards this contingency fund. They should also increase the fund to the desired level from the surplus of Rs 18,000 per month (See Table Plan of Action). Also, the contingency fund should be invested in ultra-short-term funds, and the sum should not be used for any other purpose. The key to success is discipline. Get adequate life insurance: Rashpal has already purchased four traditional plans and is paying an annual premium of Rs 1.16 lakh. The internal rate of return (IRR) of all traditional LIC plans, after considering present surrender value, future premiums payable and expected maturity value based on current bonus rates, is likely to beat inflation; hence, the plans should be continued as debt portfolio. As per the need-based theory, the family is inadequately covered in terms of life insurance and requires an additional life cover of Rs 3.50 crore. Therefore, an online term plan for 10 years will be required, costing around Rs 64,000 per annum. While buying fresh insurance, one must disclose all relevant information, including health history, habits (if any) and existing insurance plans. Go for health, disability cover: Rashpal has done it right and bought health insurance worth Rs 10 lakh (sum assured) for himself and his family. But he should consider the steadily rising medical expenses and increase the sum assured to Rs 20 lakh at the next renewal, which will cost around Rs 60,000 per year. He should also buy critical illness insurance worth Rs 1 crore and an accident disability cover for himself, also worth Rs 1 crore, costing him a total of Rs 60,000 a year. For the premium paid up to Rs 25,000 for self and family, Rashpal can claim tax deduction under section 80D of the Income Tax Act. Dwindling jobs, evolving economy and huge demographic shifts often make us feel stressed about money when it comes to saving for major expenses-college, retirement and the opulent Indian wedding. 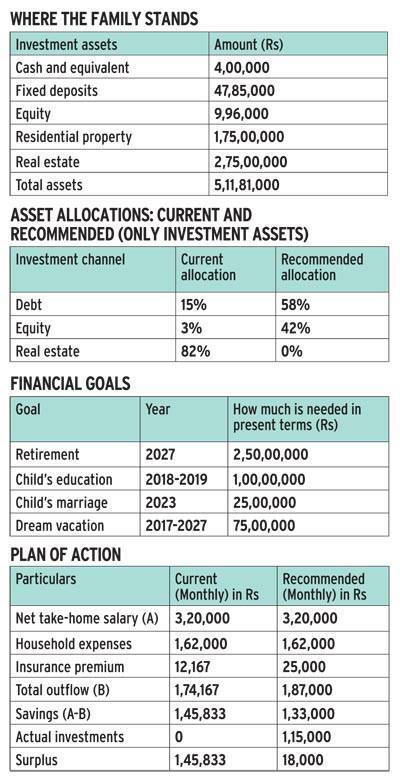 Here is how Rashpal and family can do it right (See Table Financial Goals). Focus on retirement savings: This is of prime importance and must not be neglected. Ideally, one should always try and pump up retirement savings. Unlike many older workers, Rashpal is planning to retire at 60 and he will require a corpus of Rs 8.40 crore to take care of his retirement and that of his spouse, till the age of 80. The corpus has been fixed assuming household expenses of Rs 1.50 lakh per month in present term and factoring in 8 per cent inflation. Rashpal is required to start a monthly investment ofRs 1,15,000 via SIP in diversified equity fund schemes to build up retirement savings. Prepare to pay education bills: Most families struggle to pay astronomical college bills. Rashpal is now planning to send his son to the US for higher studies for two years and Vishal is likely to leave in October 2018. To build the education fund of Rs 50 lakh (in today's value) for the first year, Rashpal's existing fixed deposit of Rs 48.75 lakh will be used. He should add one month's surplus to this and then stop making fresh fixed deposits. For the second year's cost of Rs 50 lakh, he will have to sell his investment in residential properties. It will be wise to park the money till the goal period in an arbitrage fund. Finally, it's your child's marriage: It is another essential expenditure. To build a corpus of Rs 25 lakh in today's value (future value will be Rs 37 lakh when Vishal gets married in 2023), Rashpal should invest Rs 25 lakh from the sale of residential property in an equity savings fund. After building a contingency fund, he can further invest the monthly surplus ofRs 18,000 to buy gold, if required, for the marriage. He can also invest in gold bonds for this purpose. The plan above is presented based on the information provided by the family. They are advised to review their plan and rebalance their portfolio periodically, preferably every year.